Last week we launched a new retail e-commerce website from our sister company, Mock-Epic LLC. 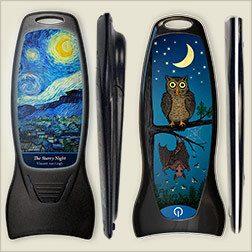 I really like this product – magnetic flat flashlights with bright LED bulbs and full color artwork on a high-quality plastic label. They are from the SmashLight® family of products from Bentcil®, and we’re making them available retail, in small quantities and bulk. The SmashLight® Messenger™ is our lowest price option, with an on/off pressure switch, large artwork area, and extra flat (.25″) design. The SmashLight® Glow™ is .5″ thick and includes a physical on/off button and a fantastic backlit art area illuminated by 2 additional LED bulbs. This is a product I’ve decided to sell because I like it so much… they’re hanging on my refrigerator, metal filing cabinet, electrical box and stashed away in half a dozen other places. I hope you like it too. For more information, see Mock-Epic LLC or FlatFlashlights.com.